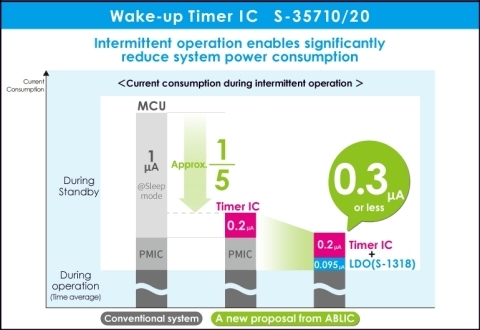 CHIBA, Japan--(BUSINESS WIRE)--ABLIC Inc. (President: Nobumasa Ishiai, head office: Chiba City, Chiba Prefecture, hereinafter “ABLIC”) today launched the S-35710/20 (I-Series), a wake-up timer IC with ultra-low power consumption that allows flexible wake-up time settings. This product has already been launched as a convenience timer for automotive use, but the new S-35710/20 (I-Series) timer IC was launched as a general-purpose wake-up timer IC. A wake-up timer IC is an IC that enables intermittent system operation by periodically starting up the system. ABLIC Inc. launched the S-35710/20 (I-Series), a wake-up timer IC with ultra-low power consumption that allows flexible wake-up time settings.